China as a country consumes more seafood than the next 10 countries combined. Last summer China’s stock market plummeted more than 30%. These are the growing pains of the Chinese economy’s slow but unstoppable transition from being “the world’s factory,” from the old ‘scale and speed’ industrial model with huge environmental cost, to a new model focused on more moderate growth with a higher value placed on an improved quality of life. Seafood has a unique status in the Chinese diet. 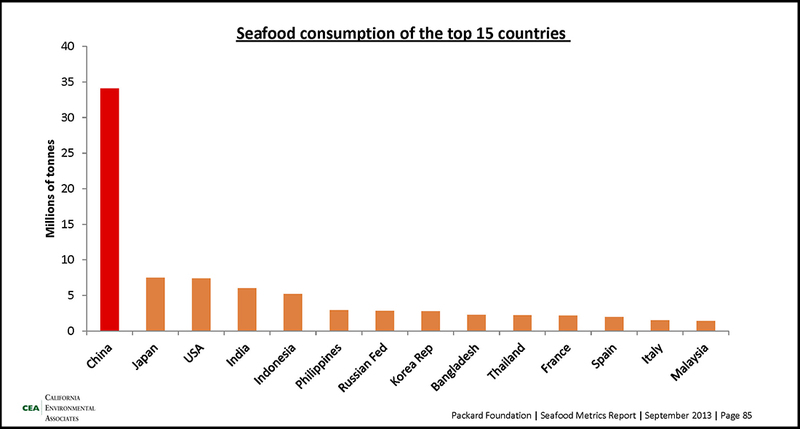 In addition to accounting for 35% of the entire world’s seafood production (wild and farmed combined), China as a country consumes more seafood than the next 10 countries combined. No proper Chinese feast or celebratory meal is complete without a classic seafood dish of sea bream, large yellow croaker or grouper. But as the economy transitions and the Chinese market grows, consumer preferences are also shifting. The health, quality, and origin of seafood (and other products) is becoming an increasing concern. Sustainable seafood, for the first time, is starting to step into the limelight in China. However, ensuring sustainable fisheries in China will be no easy task. By 2030 the Chinese population is projected to reach 1.4 billion and will consume 100 million metric tons of fish and shellfish each year. To understand how we can meet this challenge it’s important to fully comprehend the Chinese seafood industry. Without appropriate management reforms to meet the challenges of the day, Chinese commercial fisheries, which contain ¼ of the world’s fishing fleet, have been suffering from overfishing for four decades. China’s aquaculture sector presents different challenges and opportunities. Traditional fish farms in China have been producing carps, bivalves, seaweeds, and algae for millennia. However, the scale and impacts of industrial aquaculture have expanded exponentially and natural wetlands and coastal areas have been transformed for industrial production. Roughly five million square miles, an area the size of Switzerland and Netherlands combined, are now used for aquaculture production. In addition, an increasing amount of carnivorous species such as bass, snakeheads, groupers, flatfish, perch and crabs are farmed, leading to a growing pressure to small pelagic fish (harvested as feed) in natural ecosystems. Tools to achieve sustainable seafood vary greatly across fisheries, fish farms, and countries. While there are common elements and goals to any sustainable fishery or aquaculture project (e.g. access regulations and the maintenance of biological productivity), standardized solutions to these complex problems will simply not work. Fishery and aquaculture improvement efforts that are creative and culturally relevant will be paramount to revitalize Chinese fisheries and ensure sustainable aquaculture. Songlin Wang, who lives in Qingdao, China, is China Program Director for Ocean Outcomes, leading O2's sustainable fisheries and aquaculture initiatives in the region.